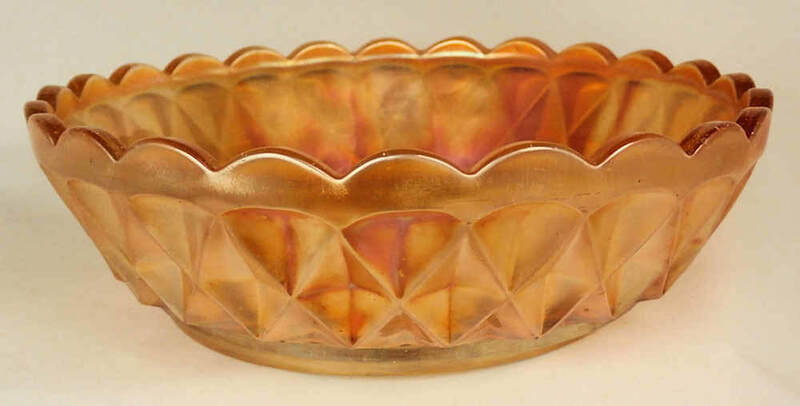 Some twenty or more years ago, we were browsing the shelves of an antique mall in the university town of Oxford when we came across this small marigold bowl - a pattern that we hadn’t seen before. It measures 6¼ inches across and has an exceptionally wide 4¼ inch base (with an 18-point star), that provides a good, flat surface for the intriguing interior design. We called the interior design “Oxford Cross” and the exterior pattern of interlocking diamonds “Oxford Diamonds”. Twenty years on and we still do not know for certain which maker produced this intriguing bowl. But a few weeks ago, while browsing newspapers from 1937, we came across an item that stopped us in our tracks. Left: the Jopling's ad in a 1937 Sunderland (England) newspaper. 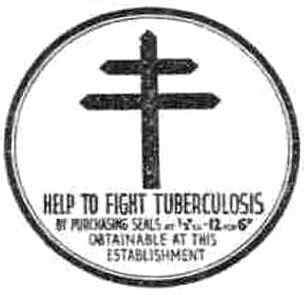 Above: detail of the "Help to Fight Tuberculosis logo. The distinctive cross shown in the newspaper ad above is the Cross of Lorraine – it was adopted in 1902 at the first International Conference on Tuberculosis in Paris. It represented a crusade for good health against sickness, and it soon became a familiar symbol in almost every country around the world. It was used on public health advertising campaigns, promotional campaigns for fund raising to build sanatoriums, charity seals, stamps and much, much more, in the international fight against the killer disease TB. We even read that the TV show “History Detectives” featured a Harley-Davidson motorcycle that was painted with the Cross of Lorraine – the bike was used to promote anti-TB campaigns in rural Wisconsin around 1914. Research uncovered the fact that Harley-Davidson donated a number of motorcycles to the Wisconsin Anti-Tuberculosis Association so that they could travel around and educate people about TB – and the Cross of Lorraine was painted on the bikes fuel tanks. ​Poster ads from 1910 to 1950 used the Cross of Lorraine motif as part of the International campaign to eradicate tuberculosis. Left: a poster from Ireland in the 1950s. It’s difficult for us to identify with it today, but in the 19th and early 20th centuries, TB was the leading cause of death and seen as “one of the most dreaded diseases known to mankind” (U.S. National Library of Medicine). The Cross of Lorraine was a familiar and recognisable public health symbol for TB that featured on all sorts of artefacts, and in almost every country around the world – indeed posters and ads used the motif well into the 1950s (as above). ​It made us think. Was our mystery Carnival pattern intended as a promotional item for the worldwide campaign against tuberculosis? Clearly the symbolic Lorraine Cross was used in the design, and various forms of leaves also seemed to be included on many renditions of the public health campaign illustrations that we have seen. The money-raising campaign (to provide research, sanatoria, greater public health awareness and education) clearly needed funds. 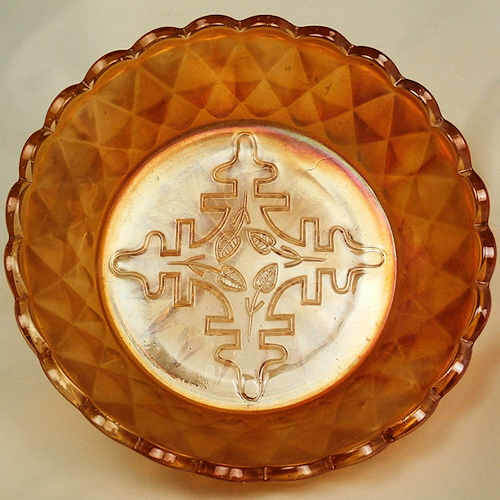 Is it possible that our bowl featured the Lorraine Cross symbol in a fund-raising enterprise associated in some way with the TB campaign? Previous theories (including ours) have alluded to possible mystical or religious symbolism associated with the “Oxford Cross” bowl. But Carnival Glass was made for commercial reasons – of that there can be no doubt. It’s highly unlikely that this press-moulded bowl (surely originally made in fairly large amounts) was some kind of cryptic or sacred relic for the illuminati. It’s much more likely that it was a commercially produced, promotional item, featuring the logo/symbol of the worldwide campaign to fight tuberculosis.